In just ten working days, your truck has been transformed from a 2D drawing to a complete set of 3D engineering renderings for every system, laser cut part and precision weld. The Chassis and engine have been ordered, along with the all the materials and vendor supplied components. In the next 12 weeks, electronic data will become fully functional piece of firefighting apparatus awaiting your inspection in our state-of-the-art delivery bays. “Marion is different,” said Ross Fischer, Production Manager for Fire & Emergency, “It’s important to be open to ideas on both sides. 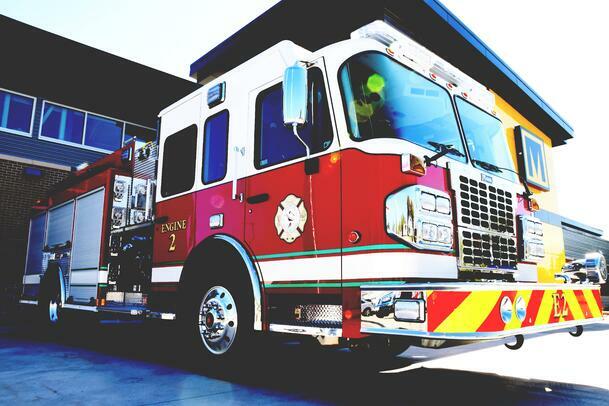 We will listen to you, and if you’re willing to listen to us, together we will get your truck to work.” Of course, before we hand you the keys, our highly skilled fabrication team will to have turn raw materials and certified components into a fire truck. Production Manager Fischer will convene an initial meeting with engineering and each of the four build team leaders. They will review the engineering specs and give input based on their fields of expertise. The approved plans will be sent to computer terminals on the shop floor in the Frame Up, Plumbing & Chassis Modification, Electrical and Final Assembly departments. Over the next three months, more than 30 highly skilled craftsmen will build your truck practically from the ground up. Their orchestrated movements will circle around the truck chassis, adding parts and assemblies until its bare bones become the customized unit you’ve ordered. Body panels and supporting structural tubing will be laser cut from military grade aluminum stock in the Fabrication department and Frame Up will weld and construct the body. Simultaneously, the Plumbing department builds and plumbs the pump module and electricians wire it once the completed module is set in place on the chassis. When the body comes back from the paint department and is set on the chassis the doors, lights and diamond plate are installed. The Final Assembly department will then install water tanks, generators, and other components as specified. At this point, the nearly completed truck enters the testing phase where the pumping system is filled with water, fired up and checked for leaks. Upon in-house approval by the Production Manager and Department Leads, your truck will be submitted for third party testing under full power. We will then finish off the tags and covers, trimming out the vehicle and getting it ready for inspection first by the team Leads to make sure it meets the engineering specs, then by the sales team for our final approval. When, and only when, the truck passes every one of our in-house quality control standards, we’ll invite you to do the same in our state-of-the-art delivery bay. Marion has been delivering on promises for 113 years, what would you like to order? Your journey to a new truck has progressed from a community need, into a concept, then moved through budget meetings and fundraisers. Your team has met with sale professionals and maybe even visited manufacturers, reviewing diagrams, renderings, and quotes. You have finally agreed on a design and are ready to place your order. It's time to sign on the line and get that truck built! With most manufacturers, you’d be right. Marion isn’t most manufacturers, we’re going to go over the entire project again with our engineering team to validate the designs and preflight the build. Adding this extra step eliminates minor mistakes before they become big production headaches, keeping your build on time and on budget. Marion’s Engineering Department becomes involved in earnest upon your acceptance of the truck bid. Prior to final acceptance, your Technical Sales & Contact Administrator (TSCA) will meet with representatives from our engineering team to verify the 2D Sales drawings, check for errors and come up with the final submittal. You and your team will meet with your TSCA, and our Engineering team to critique any changes that have been made to the truck. Upon your approval, the designs are released to engineering. Your TSCA will then meet with our full team of electrical, plumbing and mechanical engineers to bring your vehicle to life. The Body Department will convert the 2D sales drawings to the 3D engineering renderings for fabrication of the truck, while the electrical engineers make CAD drawings for the wiring harness and plumbers design the piping plan. The engineering team will work together to develop interconnected systems for control panels and consoles, preflighting layouts and verifying components. This will include going over the order item by item and verifying special items. They will generate engineering drawings and/or specification sheets for any special order parts or components that are included, create diagrams for special options and create custom harness prints for any options that require them. Chassis modifications and equipment installations will be finalized and then reviewed by the entire team before placing orders for components and scheduling fabrication. While it sounds like a monumental effort, Marion has finely tuned the process so that an approved submittal is transformed into a completed blueprint in just eight working days. “We assist sales early on and provide support to the TSCA throughout the quoting and specifying process to achieve the cleanest spec possible,” said Josh Richling, Electrical Designer. “By getting involved early, we can work around potential problems before they become engineering nightmares.” Once the final prints are approved, the purchasing department and fabrication team will create the part delivery and manufacturing schedules. The engineering team, along with the TSCA will continue to support the fabrication team through every weld, rivet, and coat of paint. This streamlined system has been perfected over years of dedication and craftsmanship. Once you’ve sent your specs and design parameters off to your chosen vendors, you can sit back and wait to review their final numbers, right? Probably not. In actuality, the specifying process has only just begun. You see, there are a great many options to consider and pathways to take to get to a finalized estimate. Again, it all comes down to budget limitations versus the capabilities you need and those you would like to have. This doesn’t mean you have to simply take what a manufacturer will give you for your dollar. You should have the opportunity for many reviews with your builders to achieve an optimum balance of cost to capability and also for future needs and adaptations. “At Marion, we pride ourselves in being able to pre-plan for future upgrades,” said Rob Rosenau, Technical Sales & Contact Administrator. “An excellent example is a light tower, which is a very expensive option. To help you meet your budget, Marion can design the truck with all the necessary wiring and support elements in place at the time of delivery. 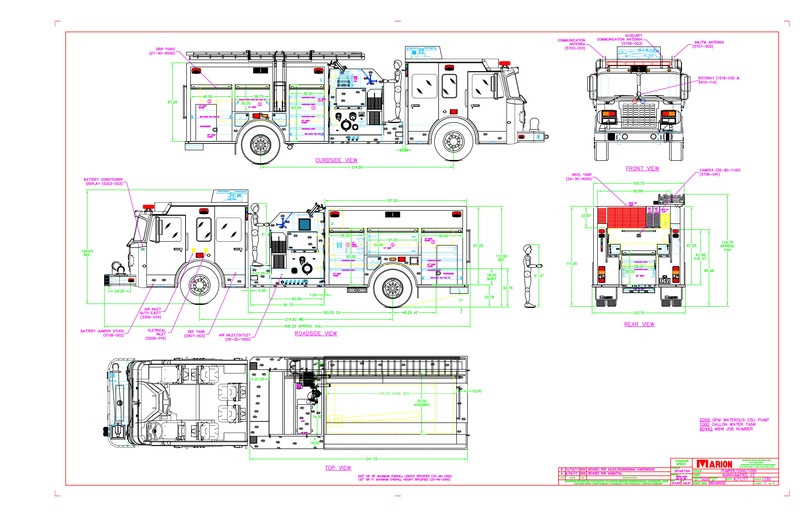 When future funds become available to purchase the tower, we are able install the it quickly, with the shortest time out of service and smallest possible cost.” Because everything changes in the Fire Service, it is essential that your manufacturer plans ahead for new equipment that has to be stored on the rig. If your manufacturer is lining out items in your spec without offering ways to easily add them later, or only giving you enough room for today’s tools, you may be getting pushed into a cookie cutter design that fits their needs more than yours. It is also important to know who you’ll be working with you on your project. Marion initially assigns a Technical Sales & Contact Administrator like Rob, who will be involved in every aspect of with your truck from design through building to service in the field. Yes, the guy who worked on your specs will be the guy you work with for upgrades down the road. Who else can say that? He will work with your local Dealer and two internal specialists on your primary estimate. This team will grow to up to 15 highly qualified engineers, electricians and plumbers who will review every weld, fitting and connection that has to be made. As the process continues, the team will expand to move the truck through manufacturing, paint and delivery. The constant through it all will be your TSCA. At Marion, we want you to be involved in every step of your truck’s process, and we believe the best way to do that is to give you one very skilled person to talk to, someone like Rob. Your Department has decided to go custom for their next truck. What next? You’ve had all the meetings, worked out the budget and financing options and finally gotten the go-ahead to start specing out a new piece of custom apparatus. Now what? You may feel overwhelmed by the sheer number of manufacturers and reps willing (clamoring) to bid on your truck. We understand. We’ve put together a few simple guidelines to help you through the process of initial specification through RFQ. First of all, understand the mission of the apparatus. This is a purchase that could be in your station for over 20 years and nobody wants their name pinned to failure. It sounds pretty obvious, but if you don’t have a clear vision for the truck, you can end up with a spec that leaves too much leeway to the competing manufacturers, forcing you to reconcile bids and go back to the drawing board. This can lead to some unfortunate delays and cost over-runs. Marion has built a number of very unique customs in our 112 year history, it is our specialty. Our Sales Reps will work with you to clearly define what you need up front so we can engineer a solution for your needs. Next, be clear about your budget. You can only spend what you have been allotted. It is a simple fact of life, but that doesn’t mean you have to compromise quality for capability. Consider the fact that bigger is not always better, and you might be able to do more with less. Why pay for a 450 horsepower engine if you can accomplish the same goal with 375hp and advantageous gearing? Also think long-term about maintenance and warranty coverage. Marion reps have the experience to recommend successful solutions for overcoming most budgetary limitations, and Marion trucks have one of the most comprehensive warranties in the industry. Most importantly, know your manufacturer. Ask if they’ve built a truck similar to your concept for a nearby department, and then ask if you can go see it. Ask if you can take it out for a test drive, you wouldn’t buy a car without driving it first, after all. Talk to their Chief about the design and build process, find out about maintenance and service needs. You can learn a lot about a manufacturer by reading through the service record for their trucks. If your rep is unwilling or unable to show you a comparable truck, you might want to look into a different brand. Ultimately, you are going to spend a great deal of time, money and effort to take a truck from concept through delivery. It is a decision that can take up to 2 years to see through to fruition, and last for decades. You’re going to have to partner with a company who values your reputation as much as they do their own. We invite you to look at Marion, and join our 112 year tradition of quality. The old saying, “You are what you eat” is easily understood by nutritionalists, athletes and firefighters across the land. Simply put, to build a better body, you need to use better building blocks. Nowhere is this concept more prevalent than inside a Marion Fire Truck. Our Engineering team has taken the concept to heart, incorporating military-spec grade aluminum extrusions into every rig we build. Why military-spec grade Aluminum? It has a tensile strength that is 91% stronger than 3003 sheet and 43% stronger than 5052 sheet. It is the proverbial “better building block” that we use as our foundation. Our engineers incorporate the superior properties of our aluminum stock into our apparatus designs to build a body and chassis system that is strong and light weight, while maintaining its structural integrity. It is so essential to our process that we purchase more than 1 million pounds of it each year. While other manufacturers may form, bend and weld their support columns and bracing components piece by piece, we source our virgin aluminum extrusions from America’s best mills. This means that the tolerances we specify are certified on every lot with absolutely no variance. The closed-profile form of the structural extrusions provides excellent fit and finish during manufacturing and throughout the lifespan of the apparatus. They are cut to length, drilled, notched and milled on advanced CNC machinery with the tightest tolerances in the industry. Marion body panels are CNC laser cut from heavy-gauge aluminum plate stock with all secondary operations performed on our in-house equipment. If you believe its what’s on the inside that counts, count on Marion. 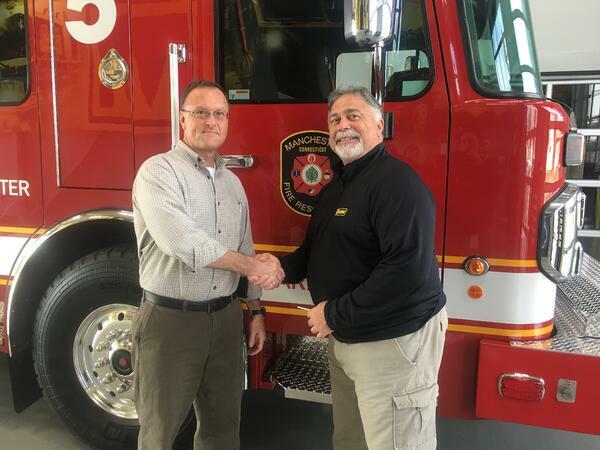 Marion builds custom fire apparatus in the Northern Wisconsin town whose name we share. We are a 112 year-old family owned and operated business and count, in our extended family, a dedicated group of 270+ employees including: engineers, electricians, welders, fabricators, painters, service, sales and support professionals. The Marion family also includes every Department that we’ve ever built a truck for, and every firefighter who rides to the scene in it, and it includes every community that we help to protect. A Marion truck is custom built from the ground up, from the highest quality components to your exact specifications. We have an open communication philosophy that runs through our entire manufacturing process, from the initial design consultations to your final inspections in our climate controlled service bays. We do not push you to a cookie cutter design. You want a 2000 GPM pump? We’ll install it the brand you want. Need a 1,000 gallon capacity tank, we’ll spec the chassis and body to accommodate it. Need a low hose bed, or extra storage for lifting bags and cribbing? Our engineers will design an answer. 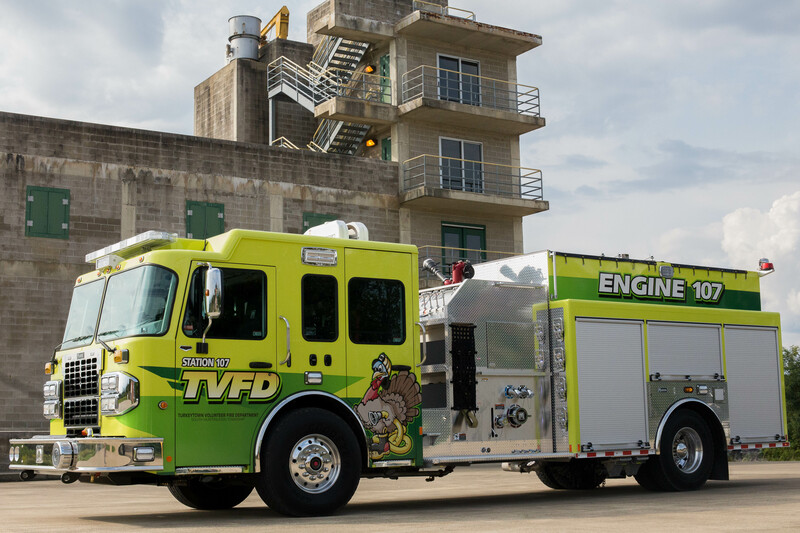 We will work with you to design and build the best rescue, pumper, tanker, aerial or hybrid rescue/pumper to serve your community. We build trucks that are designed to last using extruded aluminum with precise laser cut edges and welded seams. We incorporate advanced manufacturing techniques with the latest engineering software and a tradition of quality stretching back to 1905. We build relationships by listening to you, our customer, and delivering on our promises.